Golf is considered a game that anyone can play regardless of their physical ability or fitness level. However, without some form of conditioning program, golfers may never reach their maximum potential. A solid golf fitness routine improves your balance, develops muscle strength, and helps create an effective and repeatable swing. Strong legs mean more power and a greater range of motion. A strong upper body helps you maintain control of the golf club. The upper body also supplies most of your swing's power. These golf fitness aids and training gear will provide the most effective exercises for golf fitness. Transform your body-and improve your game! This unique regimen will get you into golf shape so you can hit the ball longer, straighter, and with more consistency-with Cindy Reid's 11-day fitness program. Can I really add 30 yards to my golf game? Yes... but let me warn you, if you are lazy and are simply looking for a magic bullet solution, this is not the program for you. The simple fact of the matter is this: the 30 Yards or More in 30 Days or Less program is NOT a quick fix. It's a SMART fix to a very complex problem that consequently yields incredibly fast results. Every golfer, at every level, can shoot lower scores and play injury-free with the golf-specific programs outlined in Golf Fitness. This book looks at the tips and techniques used by today's top golfers: Master's Champion Trevor Immelman's exercise routine, Stuart Appleby on how to develop the power move, LPGA Tour pro Suzanne Petersen's routine for top performance, Phil Mickelson's trainer Sean Cochran on staying fit in the off-season, and more. Can you really lose fat and lower your score at the same time? Yes... but let me warn you, this is NOT for lazy people or those who are looking for a magic bullet solution. Shed Pounds to Shave Strokes is NOT a quick fix. It's a SMART Fat Loss fix backed by scientific research to provide maximum results in the least amount of time. GolfGym Balance Ball The GolfGym Balance Ball is a proven, time-tested fitness tool designed to help any golfer improve core strength, flexibility, posture and balance. 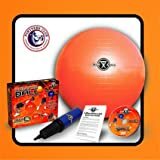 The GolfGym Balance Ball package consists of a 55cm or 65cm, two-ply, non-burst, high quality balance ball, a quick-start DVD, user manual and portable hand air pump. The Balance Ball Training DVD features Tour coach Joey D. with bonus video from the PGA Tour Fitness Trailer. This ball comes pre-packed with its own pump and is a useful tool to improving a person’s overall balance which plays a key role in improving one’s overall golf play level. It is made to withstand force and resistance while a person trains with it which is why it feels very sturdy. This book acts as both a motivational and practical guide towards helping players achieve an overall improved level of golf play. With over 100 photographs to help players learn and develop their own perfect stance, this book makes for a great reading material and the content has been thoroughly researched by sports-medicine specialist, Vijay Vad. The Kai Fitness for Golf package includes: 8 DVDs, workout band, erasable wall chart, nutrition guide, and exercise booklet. 18 different workouts all designed to help you hit the ball farther, hit the ball more accurately, lower your score, and to help you get into the best shape of your life. Workout with Kai Fitness for Golf just three days a week, less than 60-minutes per day, and you will start noticing improvements on the course and in your personal well-being almost immediately! The key to achieving better play in golf relies on the body’s posture and swing movement. Pilates is the perfect exercise that focuses on developing an individual’s isometric balance by simultaneous stretching, strengthening, toning and alignment of the body and joints. The Powerstroke golf fitness attachment is designed to develop all of the muscles incorporated in the golf swing. Functional training for golf is now accepted by all the top pros and anyone looking to improve their game and health. This effective tool can be used with resistance bands, home gyms and in health clubs worldwide. The Powerstroke transforms your basic exercise equipment into a golf fitness training aid for under $50.00. If you are a physical therapist, golfer or a golf fitness (TPI) professional then you will want to own this golf specific fitness tool. Exercise smarter with the TRAINERball Golf self-guided stability ball. There are 16 essential exercises printed on the ball, each of them hand-selected by trainers to optimize a golfer's stability and core rotation. Build core stabilizers, improve flexibility and muscle regeneration. Hand pump included. The TRAINERmat was designed by professional trainers for serious golfers to build flexibility and rotational velocity. Reduce the risk of common golf injuries by integrating these exercises into your pre- and post-round routine. The practice exercises printed on the mat fall into four different categories. s it possible to improve your golf swing or perform a perfect putt when your muscles are stiff and sore? The answer is obviously no, and yet this is exactly what many golfers do. They are not able to perform at their best because their bodies are not at their best. Although it is completely intuitive, most recreational golfers ignore the relationship between being relaxed, flexible, and playing a great game. Don’t be one of them. The Ultimate Guide To Golf Fitness is truly the place to start when it comes to golf fitness. Mark Tolle the owner of Golf Fitness Chicago wrote this book because of his belief that using fitness to improve your game is a lot more than just starting an exercise program. Sure, there are great exercises that can help increase flexibility or give you more powerful hips, but the true secret is in the implementation of a specific system for developing and utilizing your fitness program. Weight Training for Golf is the most comprehensive and up-to-date golf-specific training guide in the world today. It contains descriptions and photographs of the most effective weight training, flexibility, and abdominal exercises used by golfers worldwide, including the 2010 US Open champion, Graeme McDowell and World Golf Hall of Famer, Annika Sorenstam. Is it possible to improve your golf swing or perform a perfect putt when your muscles are stiff and sore? The answer is obviously no, and yet this is exactly what many golfers do. They are not able to perform at their best because their bodies are not at their best. Although it is completely intuitive, most recreational golfers ignore the relationship between being relaxed, flexible, and playing a great game. Don’t be one of them.Stretching for golfers is a complete 15 minute stretching and warm up system that will help you improve every facet of your game. It includes the following:Deep Breathing Exercises - Typically ignored, these exercises will help relax and energize your body. If you’re not mentally calm before you hit the links, you will not be able to perform to your full potential. These exercises will get you there.Stretches for Your Trunk/Torso - This is the power center of your body. If you want a powerful golf swing, your trunk/torso must function at peak efficiencyStretches For Your Hips - Without knowing it, many people suffer from tight hips. Are you one of them? Proper hip rotation is vital if you want to swing a golf club with power and grace.Shoulders - Tight shoulders are the mortal enemy of effective golf swings. Performing the stretches in this book will ensure that your shoulders are loose and flexible.Stretching For Golfers will ensure that your body is in tip top condition so that you can play to the maximum of your potential. If this sounds good to you, get this book today. Discover The Relationship Between Being Relaxed, Flexible And Playing A Great Game Of Golf Is it possible to improve your golf swing or perform a perfect putt when your muscles are stiff and sore? The answer is obviously no, and yet this is exactly what many golfers do. They are not able to perform at their best because their bodies are not at their best. Although it is completely intuitive, most recreational golfers ignore the relationship between being relaxed, flexible, and playing a great game. Don't be one of them. Stretching For Golfers is a complete 15 minute stretching and warm up system that will help you improve every facet of your game. It includes the following: Deep Breathing Exercises - Typically ignored, these exercises will help relax and energize your body. If you're not mentally calm before you hit the links, you will not be able to perform to your full potential. These exercises will get you there. Stretches for Your Trunk/Torso - This is the power center of your body. If you want a powerful golf swing, your trunk/torso must function at peak efficiency Stretches For Your Hips - Without knowing it, many people suffer from tight hips. Are you one of them? Proper hip rotation is vital if you want to swing a golf club with power and grace. Shoulders - Tight shoulders are the mortal enemy of effective golf swings. Performing the stretches in this book will ensure that your shoulders are loose and flexible. Stretching For Golfers will ensure that your body is in tip top condition so that you can play to the maximum of your potential. If this sounds good to you, get this book and get ready to play your best game today! GolfGym's Balance Ball is a time-tested fitness tool designed to improve a golfer's core strength, flexibility, posture and balance. The Golf Fitness Cable Attachment is designed to develop ALL of the muscles incorporated in the golf swing. You will strengthen the muscles in the sequence they are used in both your down swing and back swing. Our patented product can be used in the home, office or hotel room when combined with resistance bands. You may also enjoy the convenience of it's versatility when using with your home gym or in health clubs! Golf professionals such as Greg Norman, Tiger Woods, and Vijay Singh attribute their success in part to a regular exercise routine incorporating golf specific exercises. If you are a Golf Fitness Professional and understand the importance of functional training for golf then this now available patented product should be in your tool box. The Golf Fitness Cable Attachment has gained popularity with golfers, physical therapists, golf fitness instructors and health clubs throughout the country. How To Use By attaching this patented cable attachment to resistance bands, a functional training system or basic commercial equipment (cable cross-over etc.) and performing proper movement, you will develop all of the muscles responsible for both your down swing and your back swing including core muscles (abdominal, oblique and intercostals). For developing muscles incorporated in your back swing, attach the proximal end of the golf handle to the resistance band or weighted cable system (pulley positioned at bottom) and slowly perform your back swing motion while in the address position, ending the movement where you would begin your down swing. Choose a resistance band or select a weight that will allow you to perform 15 to 25 repetitions. It is recommended to perform three sets each (back swing and down swing) of 15 - 25 repetitions at least three times per week Why Use This Product? In order to perform functional training for golf you will want to use a device that allows application of resistance to golf specific muscles in the sequence that they are used. 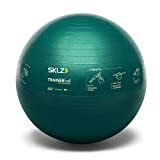 SKLZ TRAINERBALL® SPORT PERFORMANCE - SELF-GUIDED STABILITY BALL (65cm) Designed by professional trainers for elite athletes, the TRAINERball Sport Performance details 16 exercises to maximize your strength and regeneration routine. These 16 exercises include the dynamic plank, glute bridge, and knee tuck. Focus on core stabilizers, flexibility and efficient muscle regeneration. GolfGym Balance Ball The GolfGym Balance Ball is a proven, time-tested fitness tool designed to help any golfer improve core strength, flexibility, posture and balance. The GolfGym Balance Ball package consists of a 55cm or 65cm, two-ply, non-burst, high quality balance ball, a quick-start DVD, user manual and portable hand air pump. The Balance Ball Training DVD features Tour coach Joey D. with "bonus" video from the PGA Tour Fitness Trailer. Every golfer, at every level, can shoot lower scores and play injury-free with the golf-specific programs outlined in Golf Fitness. This book looks at the tips and techniques used by today's top golfers: Master's Champion Trevor Immelman's exercise routine, Stuart Appleby on how to develop the "power move," LPGA Tour pro Suzanne Petersen's routine for top performance, Phil Mickelson's trainer Sean Cochran on staying fit in the off-season, and more. Golf Fitness includes exercises to improve the golf swing, details on better warm-ups, whole-body workout routines, and notes on nutrition. The book also looks at the mental game, and how the mind and body can work together for lower scores. Any golfer looking for an edge will find it in Golf Fitness. The Kai Fitness for Golf package includes: 8 DVDs, workout band, erasable wall chart, nutrition guide, and exercise booklet. 18 different workouts all designed to help you hit the ball farther, hit the ball more accurately, lower your score, and to help you get into the best shape of your life. Workout with Kai Fitness for Golf just three days a week, less than 60-minutes per day, and you will start noticing improvements on the course and in your personal well-being almost immediately! Kai Fitness for Golf is a "full-year" program designed to help you get ready for the golf season, maintain your strength during the golf season, and get back into tip-top shape during the off-season. Divided into four specific phases, follow the routines and you will reach your goal. Don't wait. Order Kai Fitness for Golf now and play your best golf ever, and play golf longer. The GolfGym Balance Ball The GolfGym Balance Ball is a proven, time-tested fitness tool designed to help any golfer improve core strength, flexibility, posture and balance. GolfGym has teamed with Golf Channel fitness expert Katherine Roberts to host a Quick Start online video featuring exercises specific to improving your golf game. Features ? Improves flexibility and strength ? Increases core conditioning ? Enhances posture ? Improves balance If you have any questions about this product or would like to order by phone, please call us Toll Free at 888-733-8383. We look forward to hearing from you! 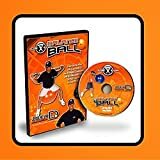 Product Description: Katherine Roberts GolfGym Balance Ball DVD: A balance ball workout program featuring Popular Golf Channel fitness expert Katherine Roberts. Develop your balance and core strength specific to improving golf performance. For use with the GolfGym Balance Ball or any similar balance or fitness ball.